What is it about animal crackers? They really aren’t that sweet but there is something about that taste that is addictive. The flavor isn’t really vanilla but is so delicate that you can’t quite determine what it actually is — or at least I can’t. I have tried for years to make them and have them taste right but I just never quite nailed that evasive flavor — until now. I found this homemade animal cracker recipe on the King Arthur Flour website. I have to tell you that I didn’t change anything other than to add the glaze and sprinkles. They totally captured the flavor, texture, and enough of the wow factor to sweep me back to childhood. Way to go, guys! The flavoring is a unique product that you can buy online or at many craft stores. I got mine at Hobby Lobby. It’s called “Princess Flavoring” and it seems to be a combination of almond, orange and vanilla. I think you can probably get a similar flavor by using 1/4 tsp almond, 1/4 tsp orange, and 1/2 tsp vanilla extracts if you can’t find the Princess flavor. The dough is a little sticky and hard to work with. You’ll want to chill it before rolling, roll and cut it and then keep the cookie sheet with the cut cookies on it in the freezer until the oven is preheated. This will not only help the cookies keep their shape but will also allow the texture to develop. Once they are baked you’ll need to decide if you want to make the iced ones or the plain ones. Of course you can always do what I did and make both. I love the iced animal crackers. Every time I went to the store with my mom she got me a box of the Barnum’s Animals and I loved them but I didn’t know that iced animal crackers existed. My first day of Kindergarten we went to the cafeteria for snack time and low and behold — iced animal crackers! It was love at first bite. The iced crackers became something special that I brought into my children’s lives. I love when things are passed from generation to generation like that. It’s a link, you know? This animal crackers recipe is just right whether you ice them or leave them plain. I really don’t like the plastic cookie cutters I have so I am looking for new ones. The small parts of the animals (legs, trunks, tails) kept sticking and falling off. You don’t have to make animals, though. Make whatever you want! The warmer the cookie dough is the harder it is to work with, by the way. These freeze well when they are left plain. Just put them in airtight packaging for up to three months. You can freeze either the baked cookie or the dough. 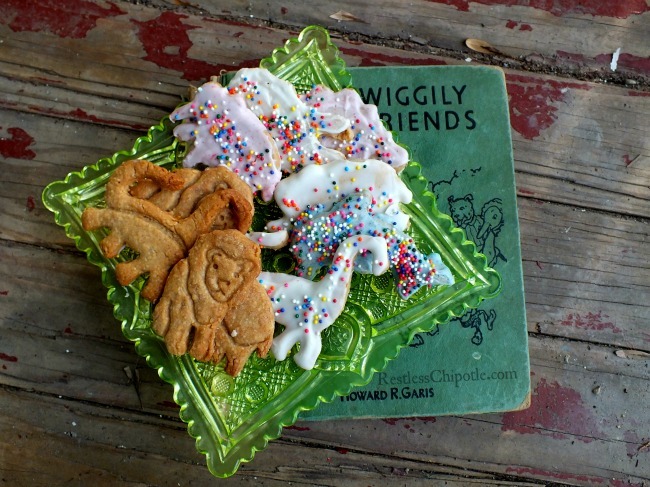 You may not have everything you need at home to make these homemade animal crackers. If not, here are the supplies you’ll want. The following are affiliate links. That means if you click on one of these links and make a purchase I will get a small percentage. It won’t change your cost at all. Princess Cake and Cookie Flavor, Bakery Emulsion – This is the flavoring that I used. I really like it in this recipe. An emulsion gives a little more flavor to the finished product than an extract. Wilton White Candy Melts, – This is what you use to glaze the cookies. You can get the melts in all different colors. Wilton Sprinkles Rainbow – Because you can’t have frosted animal crackers without sprinkles, right? Just like those animal crackers you loved as a kid. You can keep them plain or put the pretty pastel coating and sprinkles on them. Addictive. Servings: 48 or more *see note below. 3 cups candy coating such as Wilton Melts. Use your favorite colors or get white and color with oil based candy coloring. Beat together the butter, sugar, honey, salt, baking soda, and flavoring until completely combined and smooth. Mix the flour and the ground oats. Add the flour mixture to the butter mixture and beat until smooth. Lightly grease baking sheets, use parchment, or Silpat. Take the dough out of the refrigerator and place it on a floured counter. Flour the cookie cutters and then cut the cookies. Bake for 8 to 10 minutes or until golden. Longer baking time will result in crisper cookies but watch them carefully! Remove the sheets from the oven and let the cookies cool for 10 minutes. Melt the candy coating and vegetable shortening (stir often!) in the microwave until smooth. Push each cookie upside down into the melted coating. Lay coating side up on the cookie sheet and add sprinkles.